Mastering science concepts for many students can be difficult. Great instructors, learning resources, and even video games can all be ways to help students comprehend difficult information. For college students and some high schoolers, quantum mechanics is a topic that many have a hard time understanding. Researchers Johnston, Crawford and Fletcher at the University of Sydney focus on better approaches to teaching quantum mechanics concepts. Their research is driven by answering two questions: 1) How do we define the most important concepts to learn quantum mechanics and 2) How do students conceptualize the ideas of quantum mechanics (pg 428). Researchers and students at Georgia Institute of Technology have developed a quantum mechanics game for students. I recently had a chance to interview one of the students working on the project, Aditya Anupam a 2nd year PhD student in Digital Media. How long have you been working on the project? Why did you join? I started working on the project in 2016. I have a master’s degree in electrical engineering and was frustrated with how science was being taught. Why teach quantum mechanics through video games? Its immersive and easily accessible to students and teachers in and outside the classroom. What is the quantum mechanics game about? 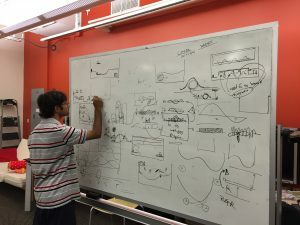 The core concept for the game(which is named: Particle in a Box) was to help undergraduate students challenge their preconceptions about quantum mechanics (which are often rooted in classical mechanics). Quantum mechanics is hard because people don’t get the opportunity to engage actively with the quantum phenomena or experiment with quantum systems. The game provides a scientifically accurate, yet fun, environment to do this. Jobs: most jobs require at least a basic understanding of science. Public discourse: It helps us become more informed so that we can support the right policy that will impact science. Is Particle in a Box being used in the classroom? And where can we play it? We tested the game on undergraduate electrical engineering students at Georgia Institute of Technology and received generally favourable results. Who is the audience for the game? The game is primarily for undergraduate students enrolled in courses involving introductory quantum mechanics, but it may also be of interested to high schoolers. Where can we play game? You can visit: learnqm.gatech.edu and please feel free to share feedback if you have suggestions on how we can improve the game. What’s the next project you’ll be working on? I plan to continue working on the field of digital media and science education. We are currently in the process of redesigning the game based on our research results. We are interested in making a multiplayer version of the game to encourage a more collaborative learning atmosphere in the classroom. Other than the game, I am also interested in the public understanding of science and how depictions of science in the media affect that understanding. If you get a chance, please play the quantum physics game at learnqm.gatech.edu. And let’s work on making sure more students are given the resources to succeed in the field of science! Notes: What is Particle in a Box? So you maybe wondering, how does the game work? The game design is very similar to Donkey Kong and Mario in the appearance and layout. Once you begin the game, there is a small textbox on the left bottom corner. The textbox has information on how to play the game and explains principles of quantum mechanics. The user plays a small blue character that has to pick up certain materials when prompted. Crawford K., I.D. Johnston and P.R. Fletcher. “Student difficulties in Learning Quantum Mechanics.” International Journal of Science Education, vol.20, no. 4, 1998, http://citeseerx.ist.psu.edu/viewdoc/download doi=10.1.1.1009.2311&rep=rep1&type=pdf. Accessed 22 September 2017. Special thanks to Aditya Anupam for the interview!! !